Walt Disney is a diversified global entertainment company that operates across four business segments – Media Networks, Parks and Resorts, Studio Entertainment, and Consumer Products & Interactive Media. The businesses in media networks segment include cable and broadcast television networks, television production and distribution operations, domestic television stations and radio networks and stations. Its cable network businesses include ESPN, Disney and Freeform. The company also operates parks and resorts in several countries including US and Japan. Walt Disney is a noted maker of animation movies and also a good marketer. 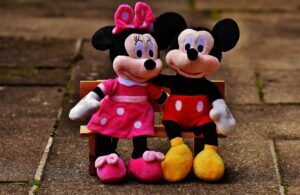 Apart from that the company is famous around the globe for its famous toon characters including Mickey Mouse and Donald Ducks. Its parks and resorts attract tourists in very large numbers each year. Walt Disney is a major marketer that markets its brand using traditional and digital channels. The company also uses social media channels for promotion and is present across all of them. Read about how it is using social media for business marketing and promotions. Facebook is a leading social media channel with a very large audience of higher than 2 billions. It is the leading platform from which most fashion and entertainment brands engage their customers and followers. Apart from promotions, Facebook offers great tools for user engagement and discussions. Walt Disney has used several accounts for promoting its brand and products from Facebook. Its main three accounts on Facebook include Disney animation studios, Disney studios and Walt Disney world. Disney studios page has more than 36 million followers whereas the Disney Animation studios page has more than 13 million followers. Walt Disney world has around 16 million followers. The number of posts that Disney makes on each page is generally limited to no more than 2 to 3 per week. The level of engagement however is still very good. each of these posts receives thousands of likes and hundreds of comments and responses. Disney shares mostly multimedia content through Facebook. the company has achieved a highly attractive level of user engagement through Facebook. Apart from comments that show users excitement over Disney movies and other products, the Facebook account also works as a feedback tool for the brand. Twitter is also a great social media platform for marketing and promotions. It offers a large audience of around 300 millions and also various tools that are most suited to real time marketing as well as user engagement. Twitter can help brands reach millions and connect in real time. Walt Disney has used several accounts on Twitter just like Facebook. Its two major accounts on twitter are Disney and Walt Disney Studios. the first one has six million followers whereas the second has around 5.1 million followers. Through these accounts, Disney makes 7 to ten tweets a week. The content that it shares is mainly promotional content. Each tweet receives thousands of likes as well as hundreds of retweets. Disney has achieved an attractive level of engagement on Twitter as well. Instagram is also an attractive social networking platform that allows ,users to share multimedia content and engage users in discussions. Almost all fashion, food and entertainment brands use this platform for marketing and promotions. This platform also offers an attractive large audience and great marketing tools. Thee are several accounts related to Disney on Instagram as well. One of them is the Walt Disney World account with around 7 million followers. The other account is the Disney account with around 14 million followers. In he first account the company has made around 1200 posts and in the second close to 3800. The brand has achieved a nice level of engagement through Insta. Each post receives a very large number of likes; several more than 3 or 4 lacs. This reflects the popularity of Walt Disney . Moreover, the number of responses is also very large ranging from hundreds to thousands. Disney promotes its movies and other products through Instagram and has achieved an impressive engagement level overall. YouTube is also an attractive channel for marketing of brands and products. It is mainly a video sharing website that businesses can use for marketing and promotions. Video marketing is now an important part of most brands’ digital marketing strategy. Walt Disney has a disney movie trailers account on YouTube which it uses to promote its movies before their launch. The company promotes its movies through their trailer and teaser videos on YouTube. The entire entertainment industry relies on the YouTube network for promotion of its trailers. Disney has uploaded more than 900 videos in its account and has more than 2 million followers. The Mary Poppins Returns Trailer has received more than 250K views in less than a week. The Lion King trailer teaser has received more than 58 million views in around 2 months only. User’s comments show their excitement for Disney movies and also their love for Disney. On Linked In, the company has around 1.8 million followers. The company uses Linked In to promote its work culture, parks, media and other products and experiences. It also engages users on several more topics like technological innovation, unconventional ideas and company culture as well as more important topics and issues. The engagement level and activity of Walt Disney is very high on Linked In. It regularly posts on Linked In and sometimes number of posts is two to three each day. The company has managed a good user experience as shows in the users’ interactions including likes, comments and responses. Thousands of likes show that Disney has been able to connect well with its fans and followers. The best thing about Linked In is that it offers a large audience of professionals and opportunities to promote your strategy and culture before them. However, a notable thing about Disney is that the kind of engagement it has achieved successfully on Linked In is possible for very few brands. Social Media has become one of the largest channels for digital marketing and brand promotions. Most fun and entertainment brands use social media channels for marketing and promotions. Walt Disney is a leading entertainment brand. It is famous around the world for its animated characters including Donald Duck, Mickey Mouse and several more. Its product/service portfolio includes movies, animated movies and character as well media and park and resorts. The brand is known as one of the most admired companies and a great marketer. It has achieved a nice level of engagement on social media and connects with its millions of followers from around the globe successful on each network from Facebook to Twitter as well as YouTube and Linked In. Social media has help walt Disney achieve very high level reach and keep its fans around the globe excited and informed about every latest release.